Peter Thompson at Ocean Independence tells me he and Marc Haendle have found a buyer for the 25.03m classic sailing yacht Agneta listed by Sandeman Yacht Company. 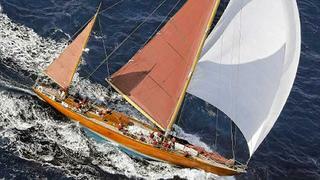 Agneta was built to a Knut Reimers design by Stockholm’s Plym yard in 1950 entirely in oak and mahogany. Owned for over 30 years by Gianni Agnelli of the Fiat dynasty, this superyacht became a familiar and highly-regarded sight on the Mediterranean regatta circuit. Always well maintained, she was last refitted in 2004 and sleeps up to seven guests in a master and two twins plus a Pullman berth. Agneta was asking €1.35 million and Peter says the new owner intends to restore her to her former glory.